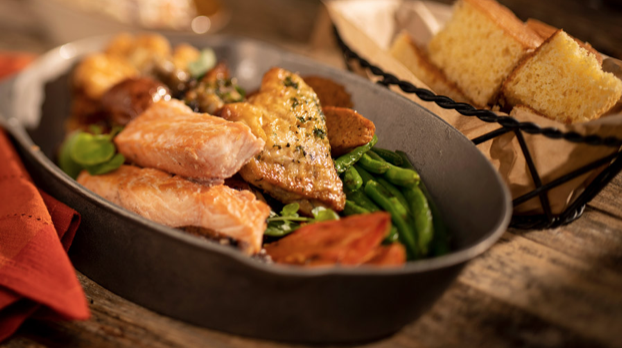 Today, Whispering Canyon Café at Disney’s Wilderness Lodge launched a new menu, offering skillets galore! The fun-filled restaurant is known for its sassy cast members, Old Western games, and fine frontier fare, which now includes a whole new array of all-you-care-to-enjoy signature skillets for lunch and dinner (starting today), as well as breakfast skillets (starting March 26). And while you chow down on these signature skillets, the rowdy canyon townsfolk are there to serve them, and their boisterous goings-on aren’t going anywhere anytime soon. Do the hokey pokey, ring the dinner bell, and even ask for ketchup (at your own risk, of course). 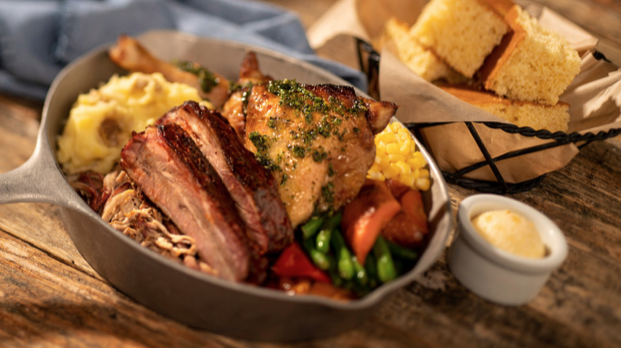 Starting with a hearty lunch option, the Signature Lunch Skillet comes with maple-chipotle BBQ slow-smoked pork ribs, barbecued pulled pork, and citrus-herb chicken. On the dinner menu, you can try the Traditional Dinner Skillet with oak-smoked mustard BBQ beef brisket, maple-chipotle BBQ pork ribs, slow-smoked pulled pork, and citrus-herb chicken. Or pig out on The “Pig” Dinner Skillet with heaping helpings of braised pork belly, maple-chipotle BBQ pork ribs, slow-smoked pulled pork, and mustard BBQ “piggy wings.” Both of these particular skillets come with western-style sausage as well. Sea-farers can order the Land and Sea Dinner Skillet, which comes with house-smoked salmon, citrus herb chicken, vegan sausage, and charred portabellas. You can also feast on the Vegan Dinner Skillet – filled with maple-chipotle BBQ jackfruit, spicy vegan sausage, mustard-glazed beefless tips, and herb-brushed trick’n chick’n. In addition, each one of these hearty all-you-care-to-enjoy skillets comes with a different assortment of sides that may include coleslaw, sautéed green beans, buttered corn, oven-roasted carrots, charred peppers, BBQ cauliflower, Yukon mashed potatoes, or roasted potatoes. Plus, chow down on freshly-baked cornbread served with delicious honey butter with every dinner skillet. 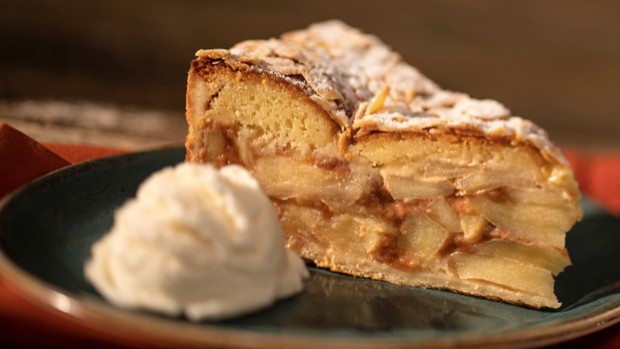 For dessert, order the Apple Pie. This mouth-watering slice of pie comes dusted with powdered sugar and is served with a big ol’ scoop of vanilla ice cream. 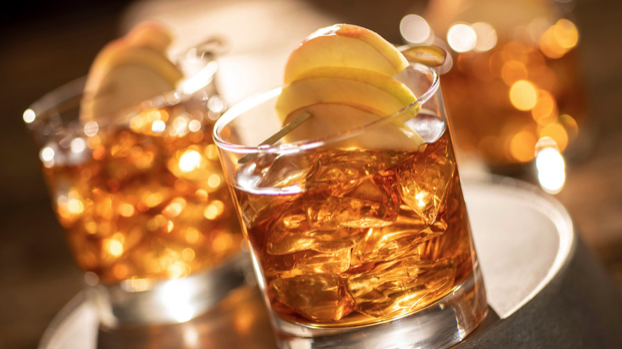 Thirsty cowpokes will also enjoy a selection of newly-themed cocktails such as the Bourbon Cowboy, which comes garnished with apple slices and pairs great with any lunch and dinner skillet. Selections of wines and draft beers are also available. 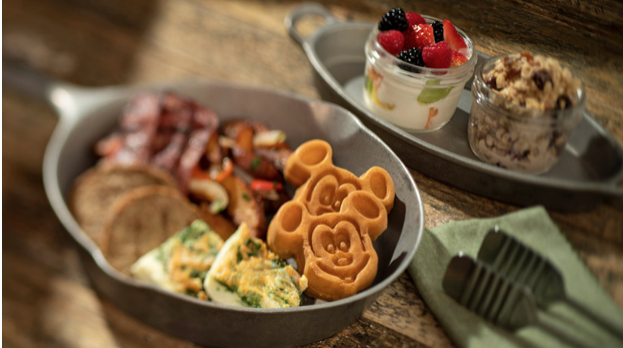 In addition, starting on March 26, you will also be able to feast on an array of breakfast skillets. Rise and shine to a delicious chuck wagon breakfast with the Heritage Skillet or the Carnivore Skillet. The Heritage Skillet comes with country potatoes, hickory-smoked bacon, and pork sausage links. For the meat-lovers, the Carnivore Skillet comes loaded with house-smoked ham, hickory-smoked bacon, pork sausage links, and oak-smoked beef brisket. Both of these skillets come with house-made buttermilk-cheddar biscuits, scrambled eggs, and Mickey Waffles. For those looking for a lighter start to their morning, the Lighter Side Breakfast Skillet is a great option. It comes with Bircher Muesli (Swiss oatmeal), egg white spinach frittata, turkey bacon and turkey sausage, country potatoes, fresh fruit, yogurt, and of course, more Mickey waffles! The parks and even some resorts usually have a caricature stand where you can have a fun picture made. Pricing is reasonable and it only takes about 20 minutes total. There is a book of choices and ideas, but the artist can make adjustments on the fly. The artists are incredible and the result so amusing! My kids both wanted one on our last trip, themed after their chosen sports. They are now both hanging in their rooms. Disney’s Wilderness Lodge recently refurbished their main pool. The pool and slide didn’t change, but they did revamp the children’s pool area. and added a fence around the entire area. The children’s pool was removed completely and a new Splash Pad put in. These Splash Pads are a big hit with the kids and lots of fun. Although there is a 48 inch height limit, there were kids playing on it that were over that height. Sprayers, buckets of water dumping out, slides…it’s lots of fun! There is also a hot tub between the Splash Pad and main pool as well as the Trout Pass Bar. There is a second pool, the quiet pool over by the villas with an additional hot tub, but this pool will be torn out and a completely new pool area will be replacing it with the addition of the DVC cabins. It’s scheduled to close in just a month’s time. 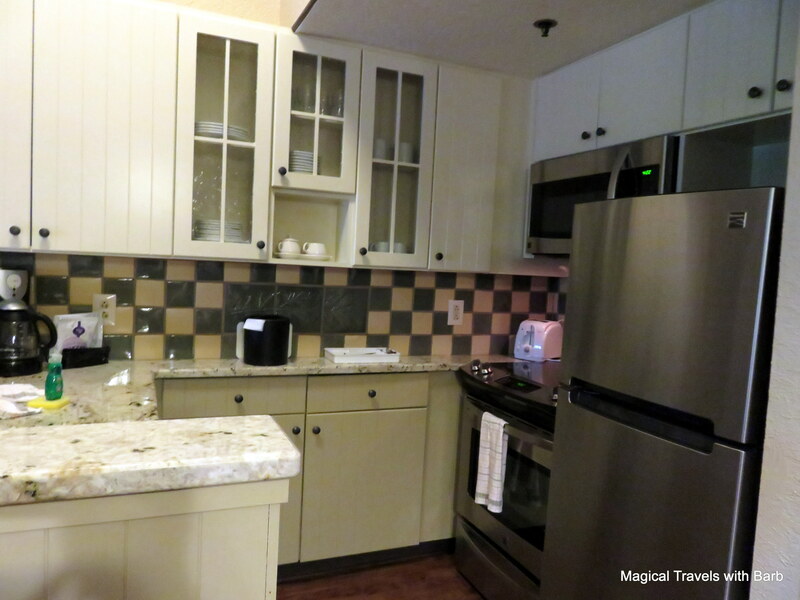 We recently returned from another fabulous family Disney vacation, this time making our home base a 1 bedroom villa at the Wilderness Lodge. The villas are housed in a separate building right beside the lodge and accessed by a covered walkway where western music guides you to the villas own majestic, if on a somewhat smaller scale, lobby. Check-in occurs in the main lodge, there is no check-in desk in the villas lobby. The villas have been refurbished since we last stayed in one and are lighter and airier than before. The dark kitchen cabinets are now white, carpet is now wood flooring and overall the villas are brighter. The 1 and 2 bedroom villas offer a full kitchen and stackable washer/dryer making life very convenient indeed for keeping up with laundry and having breakfast and even lunch if you wanted to in your villas. A pull out queen sofa makes up the main room along with the kitchen and entryway. Then a split bathroom with jetted tub and separate shower and a king size bed in the bedroom make up the rest. The 1 bedroom villa features two balconies. We were on the 5th floor, the top floor so our villas had vaulted ceilings and our balcony had a solid wall. 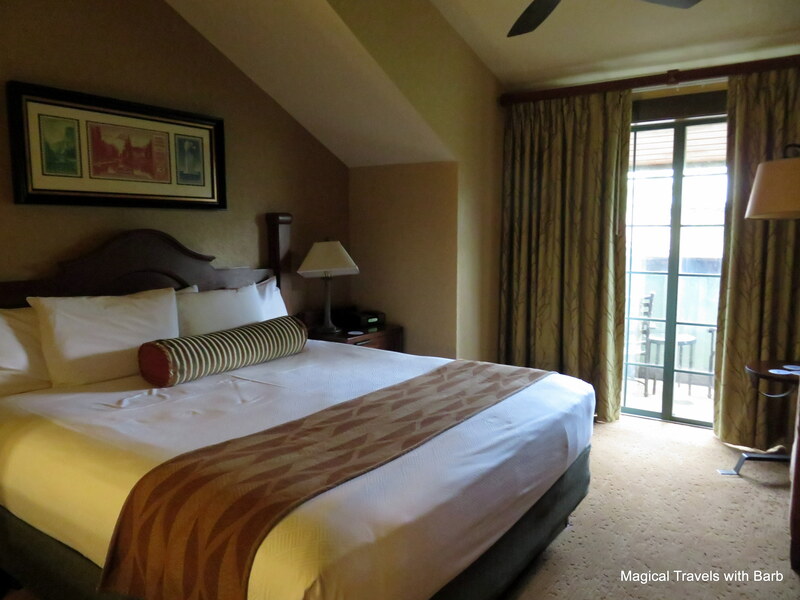 When booking the resort directly with Disney, just as you would a regular room, mousekeeping is daily. 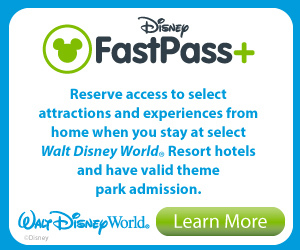 When booking on DVC points, it’s every 4th day. Detergent was provided daily for the dishwasher and laundry. We took advantage of grocery delivery options to have staples delivered for breakfast and of course, beverages. The Mercantile in the Lodge does have a nice selection of food items and essentials, but you’ll save money by ordering in advance. We use Garden Grocer and have had great success with them. Other than the health club, which is located in the Villas lobby, all other resort amenities, restaurants, etc… are located in the Lodge. Signature restaurant Artist’s Point, the fun and playful Whispering Canyon and the counter service Roaring Forks. 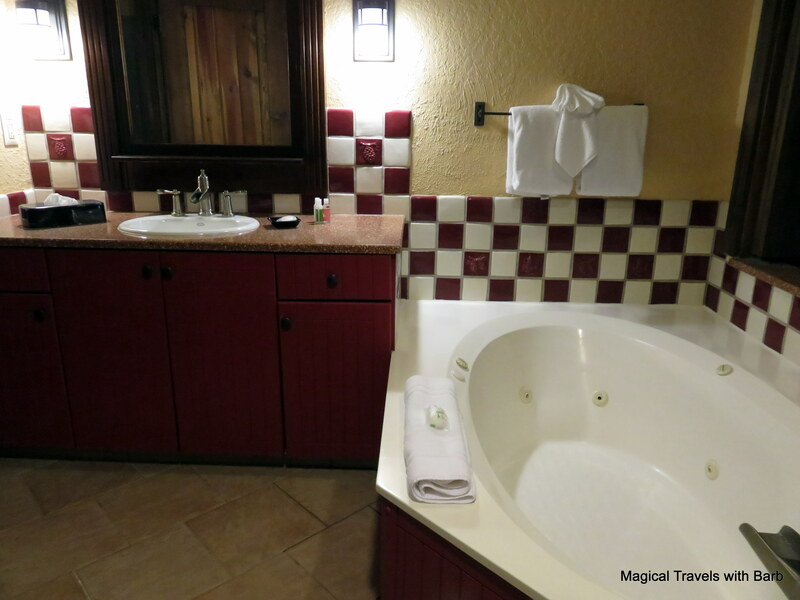 The quiet pool is just steps outside and a short walk around to the main pool, pool bar, beach, marina with boat rentals and the boat dock for the ferry to the Magic Kingdom or Fort Wilderness and the Contemporary. 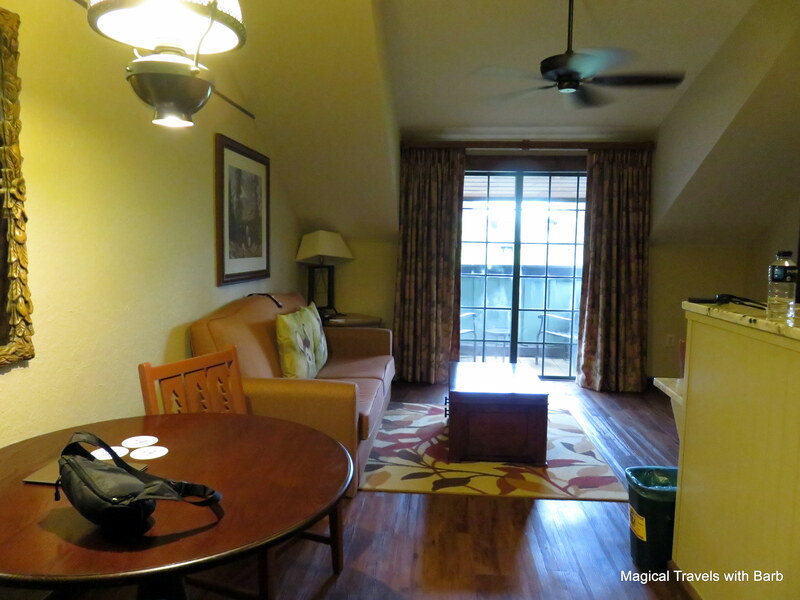 The Wilderness Lodge is a fairly compact resort in comparison to some of the sprawling resorts Disney offers, so nothing is really too far away. 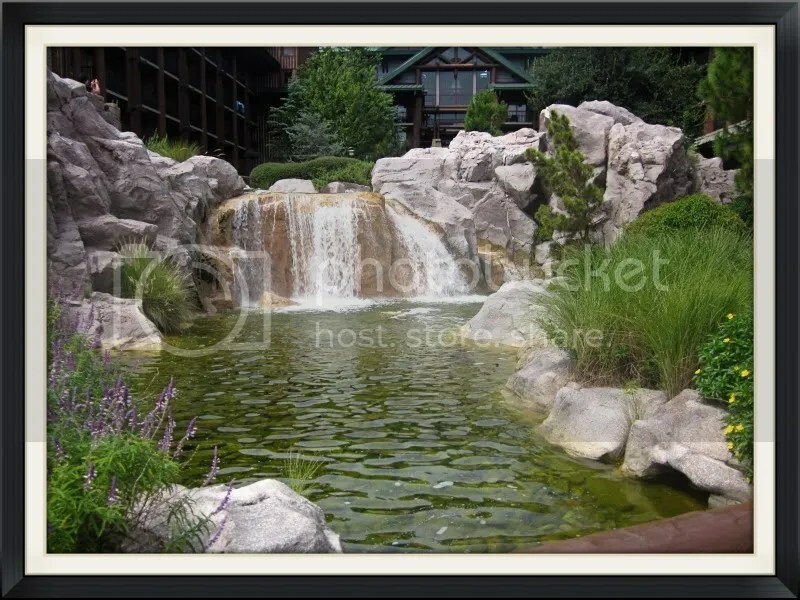 Pretty as a picture, the waterfall and landscaping at Disney’s Wilderness Lodge Resort.